Valley Center was the site of the capture of the largest California Grizzly Bear in history. In 1866, a grizzly weighing 2,200 pounds was killed in the area. Although the town had been settled in 1845 and homesteaded in 1862, it had no formal name until the famous 1866 bear incident. The notoriety surrounding the event gave Valley Center its original name of Bear Valley. The name was subsequently changed to Valley in 1874, to Valley Centre in 1878 and, finally, to Valley Center in 1887. A giant grizzly bear, which had been threatening both man and cattle, was killed near the home of James and Ada Lovett in 1866. Lovett and several men dragged the giant animal to where it could be loaded onto a wagon and drove eight miles to the Vineyard Ranch of Col. A.E. Maxcy who had been offering a reward for the capture of the bear. The bear was hoisted onto Maxcy’s cattle scales where it weighed 2,200 pounds and was declared to be the largest grizzly bear ever killed in California. The bear was skinned and cut up, with more than one pound of lead found inside its head. Col. Maxcy kept the skull of the bear as a souvenir until around 1900 when it was reportedly sold to a museum in the south, believed to be either Georgia or Tennessee. Efforts in recent years to locate the skull have been unsuccessful. The killing of the grizzly was witnessed in 1866 by the 6-year-old daughter of James and Ada Lovett. Some six decades later, in 1932 at age 72, Catherine E. Lovett Smith returned to the family homestead for a visit and provided an oral history of the event to the owner of the ranch, Edward P. Haskell. Mr. Haskell prepared a 3-page documentation of his interview with Catherine and provided a copy for the local history archives at Valley Center Library. His report is titled, How Bear Valley Got Its Name. A peach grower, Haskell created a peach label showing an old oak tree on his property where the bear reportedly attempted the attack. The tree still stands off Guejito Road as does the Lovett home. Descendants of two other pioneer families concur on the story of the bear and how Bear Valley got its name, but differ on the size of the animal. Clyde James, whose father homesteaded here in 1879, said the bear was well over 1,000 pounds. Waldo Breedlove, Sr., born here in 1889 and who grew up near the Lovett ranch, gave the exact weight as 1,950 pounds. In 1902, the 26th President of the United States went on a bear hunt, but refused to shoot the bear cub. A cartoon appeared in the Washington Post to publicize his ethical decision. So popular was Theodore Roosevelt’s decision that a toy stuffed bear was created to celebrate the event. And thus was born the Teddy (Roosevelt) Bear. The California Grizzly Bear, the largest and most powerful of the bears, thrived in the state for centuries. Some grew to a formidable height of 8 feet and weighed 2,000 pounds, according to a history of California written in 1898. When European immigrants arrived in the state, it was estimated that 10,000 grizzlies inhabited most regions of California. As humans began to populate the state, the grizzly stood its ground, refusing to retreat in the face of advancing civilization. Less than 75 years after the discovery of gold, however, every grizzly in California had been tracked down and killed. It has been extinct since 1924. Although the grizzly had roamed the state at will for 300 years, the gold rush of 1849 rang the death knell for the bear. It has been said that the appearance of the repeating rifle in 1848 spelled death for the grizzly. Initially hunted by miners and others because it was considered dangerous, the grizzly was then mercilessly hunted for sport and for its warm fur. Settlers in the late 1800s commonly shot and poisoned bears to protect their livestock. Spanish caballeros roped grizzlies, dragging them into doomed public battles with wild bulls. This popular spectator sport inspired betting as to whether the bear or the bull would win. This gave the modern stock market its “bear” and “bull” nicknames — the bear swipes downward while the bull hooks upward. The last known physical specimen of a California grizzly was shot and killed in Fresno County in 1922. Two years later, the last wild California grizzly was spotted several times in Sequoia National Park and then never seen again. Civilized man had made California’s official animal officially extinct by 1924. 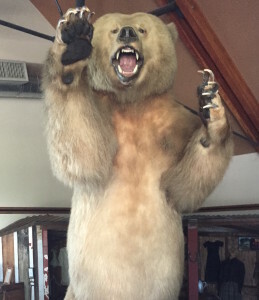 The taxidermy mount of the grizzly bear on display at the Valley Center History Museum stands nearly 8 feet tall and weighs more than 1,200 pounds. It was originally on display at the San Diego Natural History Museum (founded 1874). It was acquired in 1992 by the Escondido Historical Society for display at its Heritage Walk Museum. The specimen was donated as a generous gift in 2002 by the Escondido Historical Society to the Valley Center History Museum because the bear was a significant part of Valley Center’s local history. Bear specimens in museums commonly come from bears that died of natural causes, illegally confiscated bears, or bears that had to be put down. The California grizzly is one of the state’s most visible and enduring symbols, adorning both the state flag and seal. The Bear Flag first flew in 46 as a symbol of the New Republic of California, but was replaced by a second version adopted by the State Legislature in 1911. The bear symbol became a permanent part of the State Seal in 1849. The California Grizzly was designated the official State Animal in 1953. Sources: Local history collection at the Valley Center Library, archives of the Valley Center History Museum, the Science Museum of Minnesota, The Bancroft Library at the University of California, the Library of Congress, and the California State Library.